Q: You recently recommended Detonox detergent for a tough cleaning challenge we had. You rushed a sample over and it worked fantastically. I have reviewed your technical bulletin, but is there anything else you can tell me about it? Is it better than Alconox and Liquinox? It seems great. A: Thank you for the feedback and question. Indeed Detonox® Ultimate Precision Cleaner is an extremely potent cleaner and powerful emulsifier. It is a relatively new addition to our product portfolio. Many modern residues, often found in pharma, cosmetics, and botanicals, are becoming increasingly difficult to remove. This is even with manual cleaning methods, which imparts the extremely beneficial cleaning mechanism of mechanical energy (be it scrubbing, sonication, etc.). These residues can include titanium dioxide, zinc oxide, silicone, cosmetic bases/formulations, as well as heavy greases, tars, resins, waxes, fats and oils. Previously, these may only be able to be cleaned with solvent based cleaners which could incorporate harsh or hazardous components. These may not be as free-rinsing as a powerfully emulsive aqueous detergent. In summary, Detonox liquid concentrate detergent combines the best of our two most well-known, well-received, and effective manual detergents. 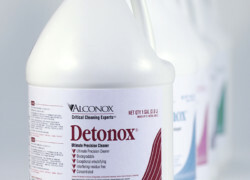 Namely, Alconox® Powdered Precision Cleaner and Liquinox® Critical Cleaning Liquid Detergent. 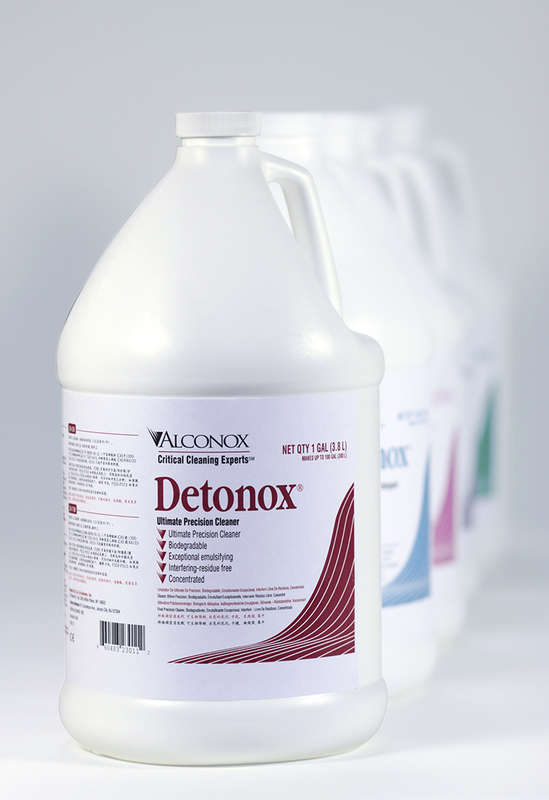 The Detonox cleaner’s potent emulsifying properties, and high detergency, is targeted for the toughest residues in your process. We’d love to discuss further.